Win A Free KIRKWOOD KITCHEN Magic Silicone Gloves Dishwashing Scrubbing… | FreebieOrBust Freebies! We have a new sweepstakes! Believe in yourself and seize the opportunity to win with us right now! 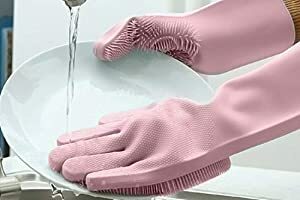 KIRKWOOD KITCHEN Magic Silicone Gloves Dishwashing Scrubbing Cleaning-Dish Wash Silicone Reusable Sponge Gloves with Scrubber, Great for Washing Dish, Kitchen, Car, Bathroom and More (Pink). Chance of winning: 1:600. There are a total of 4 prizes to win. Offer hosted by Amazon and by KIRKWOOD KITCHEN. What are you waiting for? Seize the day and register right now for the chance to win on our next sweepstakes deal! Check back to our sweepstakes platform for new deals every day!